Despite their ingenious nature and futuristic feel, light guns have been part of the video game landscape since the industry began - in fact, crude examples of the tech can be found as far back as the 1930s. In the 8-bit era both Nintendo and Sega produced their own pistol-like light guns in the form of the NES Zapper and Master System Light Phaser respectively, and both were deemed to be near-essential peripherals for any self-respecting gamer. When the 16-bit era rolled around it was understandable that both companies would look to improve on what had gone before, and - as was the trend for the time - bigger was considered to be better. The result was the Super Scope (released in Europe and Australia as the Nintendo Scope), a bazooka-shaped device which has since passed into the realms of gaming lore, despite a crippling lack of software support and unfortunate reliance on battery power. 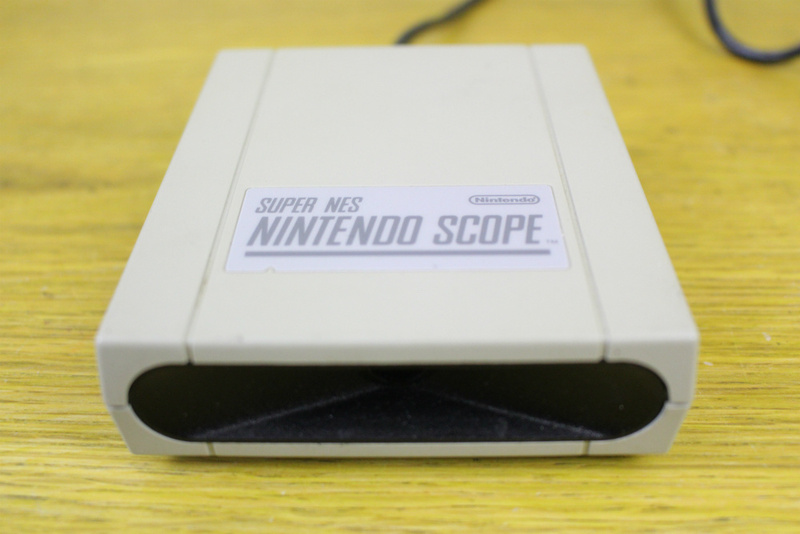 Compared to the elegant simplicity of the NES Zapper, the Super Scope is a complex and unwieldy beast. It measures just shy of two feet in length and is powered by six AA batteries. The lack of a wire connecting the Scope to the SNES is a blessing on one hand, but the need for such a large volume of batteries was something of a pain at the time of launch - even though stamina was actually very good. 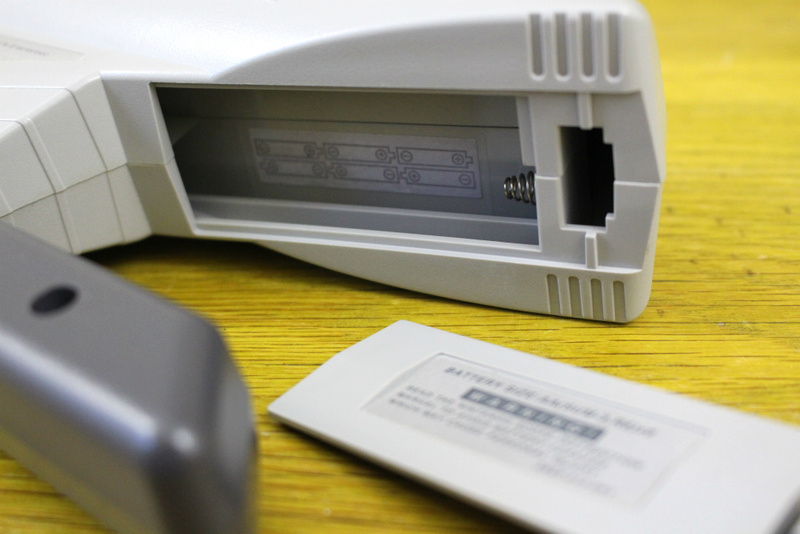 The bundled sensor box - which plugs directly into the SNES console - creates the wireless communication link between the Scope and the console. Because of its size, the back of the peripheral had to be rested on your shoulder, just like a bazooka. 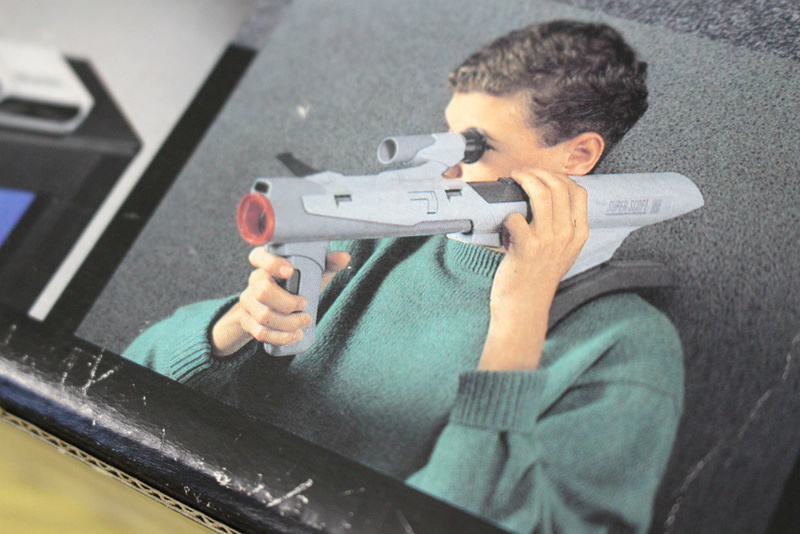 This meant that very young players experienced some difficulty using the gun, as their arms weren't long enough to rest the Super Scope on their shoulder and aim properly. The Scope operates in the same way light guns from the dawn of gaming history have done, and relies entirely on the technology behind the cathode ray tube television sets which were commonplace in the early '90s. CRT TVs do not display a constant image, but instead use an electron beam which travels horizontally across each line of the screen from top to bottom to create the picture. This scanning process is undetectable to the human eye, but not to the sensor inside the Super Scope. The Scope outputs a '0' signal when it sees the television scan and a '1' signal when it doesn't. The system notes which screen pixel it is outputting at the moment the signal changes from 1 to 0, allowing the console to determine where the Scope has been aimed on-screen. Because of this, the Super Scope will not work with modern LCD TV sets, as the pixels are always lit and no scanning takes place. The Scope also comes with a viewfinder which can be fitted to either side of the barrel, accommodating both left and right-handed players. 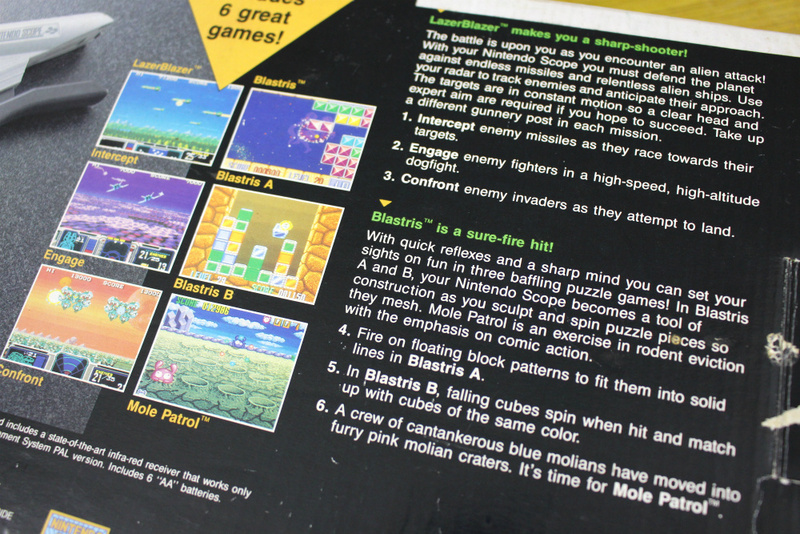 Included with the gun is a cartridge which contains 6 games, which in reality are actually spread across three main titles: Mole Patrol, Blastris and LazerBlazer. The latter two offer two and three variation modes respectively. For increased accuracy players have to calibrate the gun before starting any Super Scope game - this also allows the system to accommodate for any latency or electronic delay. Dedicated software for the Super Scope is rather thin on the ground. Only a handful of exclusive titles were produced for the peripheral, while some other games came with bonus modes where the Scope could be used as an optional controller. Intelligent Systems contributed Battle Clash and its sequel Metal Combat: Falcon's Revenge, while Nintendo R&D1 delivered Yoshi's Safari, perhaps the most convincing Super Scope game. Operation Thunderbolt and T2: The Arcade Game took their respective coin-op siblings and turned them into Super Scope-compatible releases, while the cult classic Tin Star allowed the gun to be used as an optional peripheral, along with the SNES Mouse. Kemco's X-Zone and Tose's Bazooka Blitzkrieg were the only third-party titles which were exclusive to the Super Scope. Bizarrely, 1993's Lamborghini American Challenge features a mode where the Scope can be used to blow up your rival. Predictably, Sega released its own light gun to compete with the Super Scope in the shape of the Menacer. 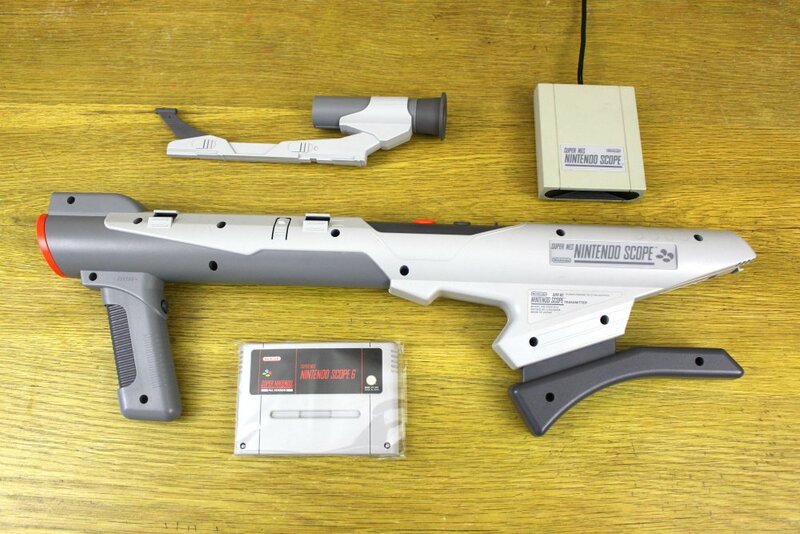 As with Nintendo's offering, the idea was to make the gun as intimidating as possible, but the hook was that the Menacer was modular and could be customised. The main gun body could be augmented by with a shoulder stock and sights, or used on its own. While Sega's gun was still dwarfed by the immense size of the Super Scope, it was bulkier than the Master System Light Phaser. Despite claims that it was more accurate, the Menacer is remembered as more of a disappointment than the Super Scope, and also suffered from a dismal lack of exclusive and compelling software. 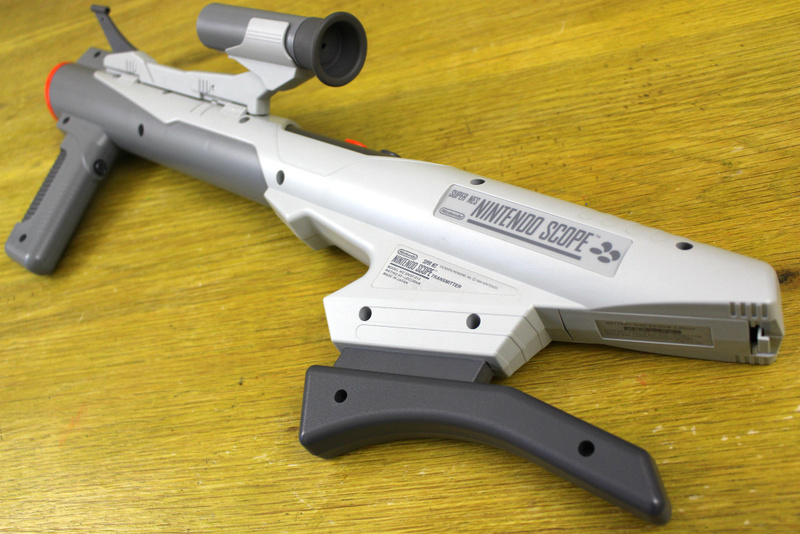 Like the Virtual Boy, the Super Scope has nevertheless been resurrected by Nintendo in some of its recent games, most notably Super Smash Bros. for Wii U and 3DS, where it is available as a pick-up weapon. The gun was also featured in the Hollywood flop Super Mario Bros., albeit with a different name ("Devo Gun") and colour scheme. 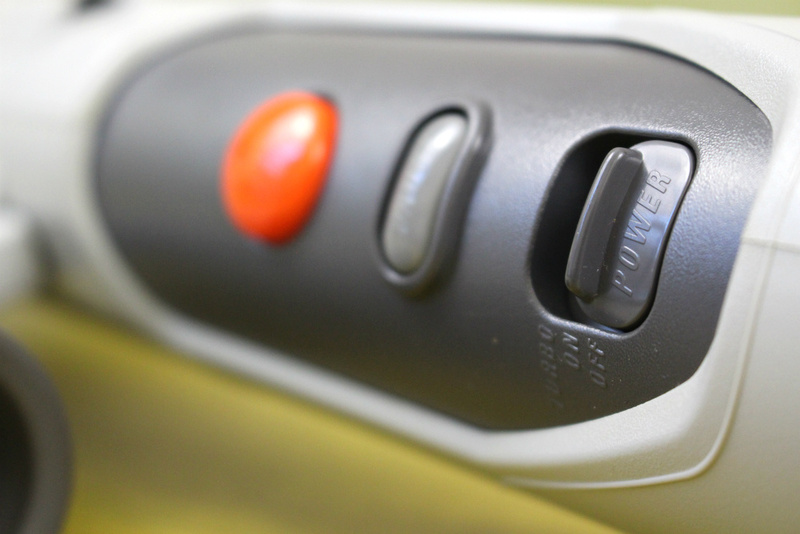 The iconic look of the peripheral has ensured that it remains a firm favourite with fans, even if it wasn't an essential purchase back in the early '90s. Because the Super Scope isn't compatible with modern TV sets, finding one second hand today is fairly easy - although it's little more than an ornament these days. Although the Nintendo Wii seemed to herald a revival for light gun titles thanks to its Wii Remote - and was blessed with excellent titles such as Ghost Squad, House of the Dead 1 & 2 and Dead Space: Extraction - the genre seems to have fallen out of favour once more, with only a few Virtual Console games truly keeping it alive on Wii U. 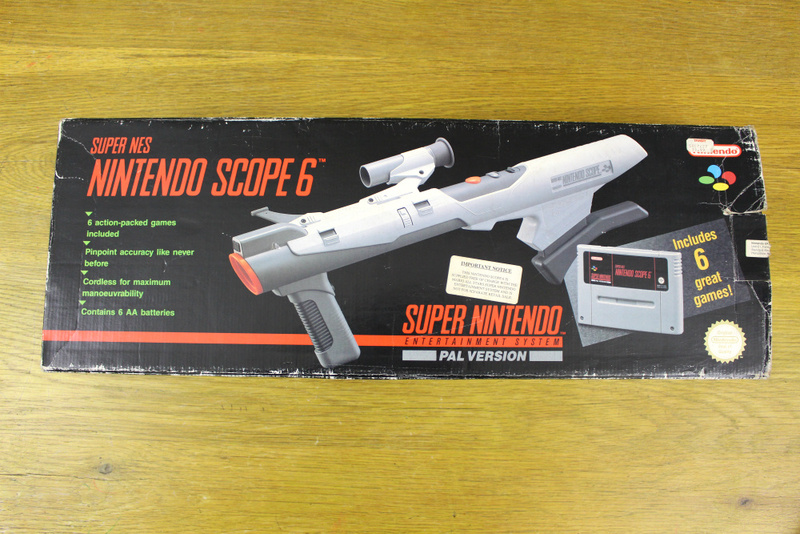 While the Super Scope didn't really live up to its potential or match the impressiveness of its imposing design, we miss the days when gigantic, gun-sized controllers were all the rage. Prepare for AVGN quotes right hier. Lol I still have mine. I loved this peripheral growing up. It just felt good to weild this bazooka. Also it is sad only a handful of titles for it. We just had Super Scope 6, Yoshi's Safari, and Metal Combat. But both Yoshi and Metal Combat wear a blast to play, since both offered an asymmetric two player mode. My friend still has his packed away somewhere. I remember playing it a little bit when we were young, but not very much. I on the other hand still have the Virtual Boy, and had a bit of fun with that maybe even almost blinded by those screens, ha ha. They sure did come out with some odd devices back then. I loved it. This is a great article on the Super Scope! I wasn't an SNESer back in the day (I'm slowly catching up on all the SNES games I should have played), but a Genesis boy, so I had the Menacer. I got the Menacer so that I could play T2 Arcade with a game gun, and was hoping for more game support. From the technical standpoint, I believe the menacer was equal to the super scope in terms of the technology behind the on-screen tracking, only the menacer was a pistol with a modular gimmick where the shoulder stock and scope were removable. I'm not sure about the Super Scope tracking, but for the Menacer all I remember is how bad that optical tracking was, and how much more difficult it was to keep the crosshairs on those terminator endoskeletons. The crosshairs would jump around on screen, off where you were aiming! The 6 in 1 game cart was ok, there was some type of Toejam and Earl game which was kinda fun...but definitely forgettable. For me, the Menacer was a disappointment. The only other game I believe came out was called Bodycount...and I wasn't using $70 (1993ish $70!) of my extremely limited, non-existent funds. Another tidbit...Revolution X (which played identically to T2 Arcade, and was actually an upgrade kit to T2 Arcade machine), which came out on all the home systems (and was pretty terrible) should have been playable by both these respective game guns, but simply was not supported. I hope the gaming experience with the Super Scope was better for everyone fortunate to own and play it. I was a little kid when this launched and I enjoyed 6 in 1 and Yoshi's Safari a lot. I would love those games to be released on Wii U with Wii Remote support. As Mbrogz3000 said, the annoying part was to keep the crosshairs and the optical tracking together. Well, I'd call it hardware. Not so sure about the classic part. I had both the zapper and super scope. Both great and lots of fun but limited amount of games. I loved the wii era and its return of this style of games. I know different tech. I mean how duck hunt and house of dead overkill both fun light gun style games. 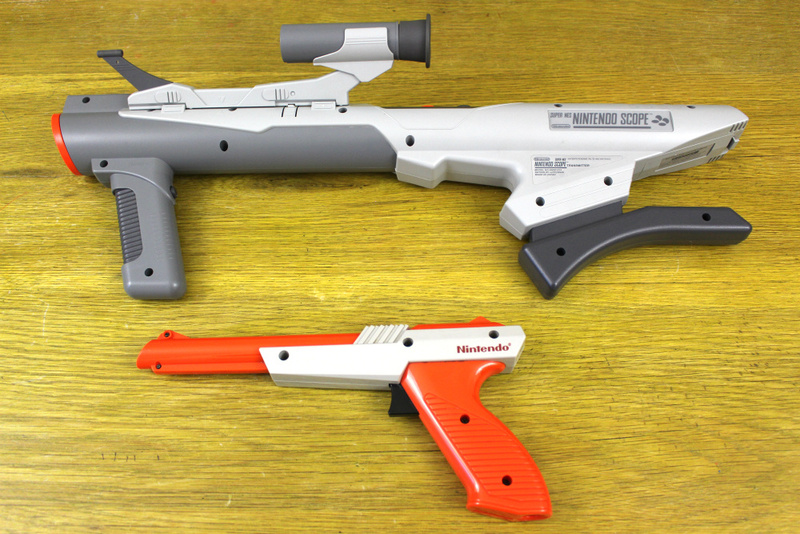 Wii mote with a shotgun attachment and even games like crossbow training were lots of fun. I was actually hoping for this to be a weapon on Splatoon since they have the two classi light guns...I'm surprised they didn't use this...or even that peripheral on the Wii. I had one of these! I got it for my birthday when I was 11 and I had a lot of fun with it. It still makes me smile to see these pop up in sci-fi movies (the "Devo Gun" in Super Mario Bros., anyone?). Thanks for article. I love Hardware Classics section. "we miss the days when gigantic, gun-sized controllers were all the rage." You should've seen my steph-brothers when they came home with this giant plastic machine gun to put their WiiMote in for Call of Duty. While I personally dislike these plastic expansions for WiiMotes, since they only tend to hinder gameplay for me (with a few exceptions like the Wii Wheel), I have to say that I do get the charm of using a giant gun for your game. While I personally don't like FPS games, I do have the classic NES Zapper and playing games like Duck Hunt or even Bayou Billy with that is a lot of fun! My mom could wield a mean light gun back in the day, she was better at Duck Hunt than me or my brother. 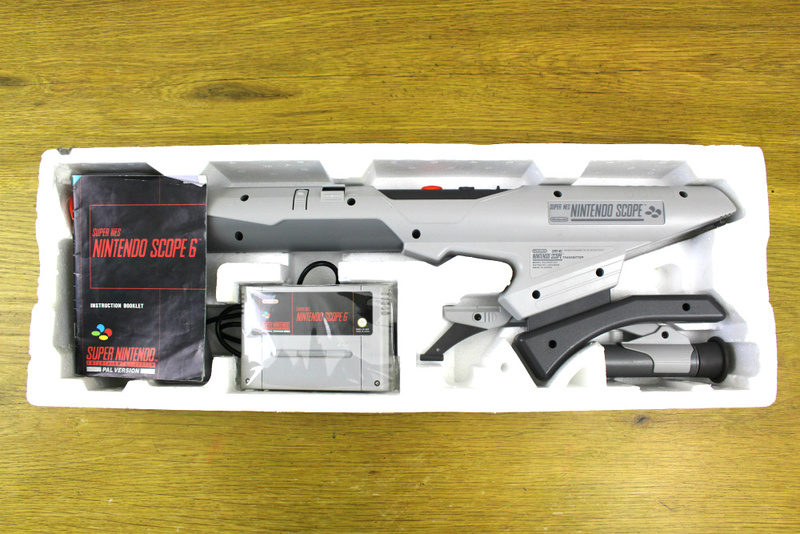 I still had this for my Super NES, one of the best light and innovative light gun ever. Only thing I wish was if Nintendo released a wired one, I don't mind as I also had extension cables for SNES so getting one without having to rely on batteries would be a blessing. 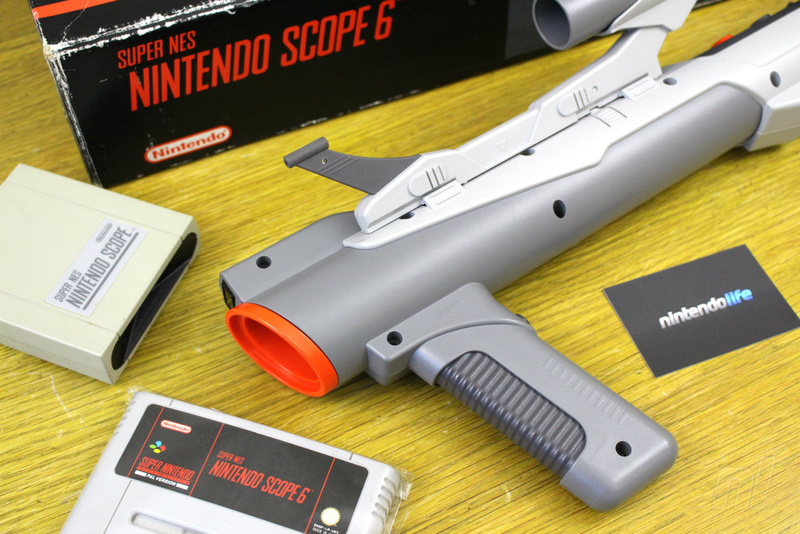 Loved the Super Scope and still have mine; MIB. My friend had one and I borrowed it on occasion. Had a lot of fun with it but can't remember what any of the software was like for the life of me. I've always been a fan of the light gun/on-rails shooter style. Hopefully VR will provide some decent ones. What a disappointment this was back in the day. Besides the lack of games, and the questionable quality of them (not to say all sucked, Yoshi's Safari was good) the darn thing was one of the most battery intensive things i've ever seen. Batteries when i was a kid weren't cheap and this thing ate them like it was going out of style. It was more of a cool toy than a video game peripheral in my household, it was a cool toy though. 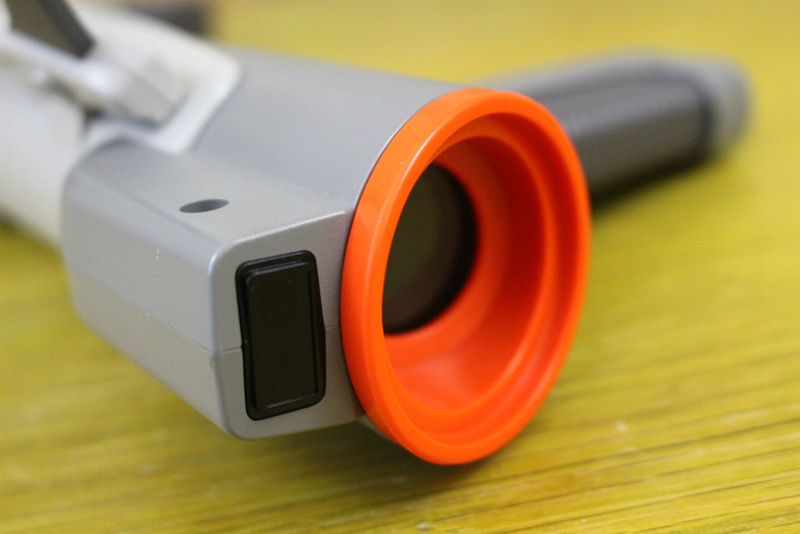 A modded Wii is capable of playing Super Scope titles using the Wii Remote. I love the light guns. The bazooka was perhaps a bit oversized, but we loved it back in the day. 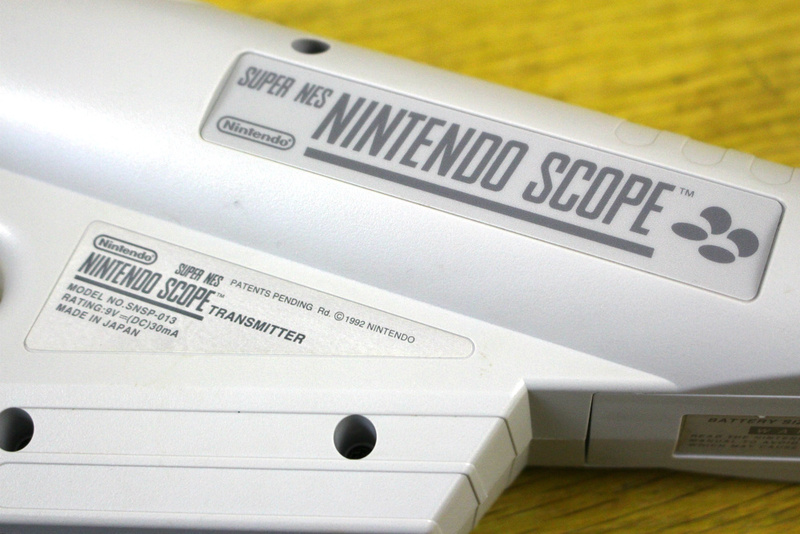 I wonder if the Super Scope would have been good if there'd been a bunch of great games for it. I had a super scope. I remember it gave me an awful headache trying to squint to use it. I still have mine and a copy of X-zone pal version in english with box and manual. That game is worth quite a bit..
i only had the zapper but that thing was awesome. duck hunt was my very first fps. that dog was NOT cute. MANDATORY NX COMMENT: since the wii u zapper never saw light of day, maybe it'll turn up for the nx. then it turns out that the new zapper IS the nx and you attach the gamepad to the nx vr helmet. 3000 ! ! ! ! All those snes scope games should be on vc by now. And throw in virtua cop 1&2....house of the dead 1-4, ghost squad, silent scope 1-3, gangster town, Mad Dog McCree, Tin Star, Lethal Enforcers 1&2, Point Blank series,Crypt killer, Operation Wolf/Thunderbolt , T2 Arcade, Confidential Mission and many others.....so much classic fun missing on the Wii U ....still!! Wow, I didn't know this one. Yoshi's Safari looks pretty good though, even today! oh s**t that's so much "treasure"
sigh I really wish my older brother didn't sell his SNES. We had one of these and a lot of great games. I've been saying "I really need to get a SNES again!" for a long time now. Its a pity they don't work on new TVs. Nintendo should rerelease all these old school shooters on the VC so they can live in the modern world again.